August is a special month for me, ask me why? It's my birth month and my son's birth month as well. 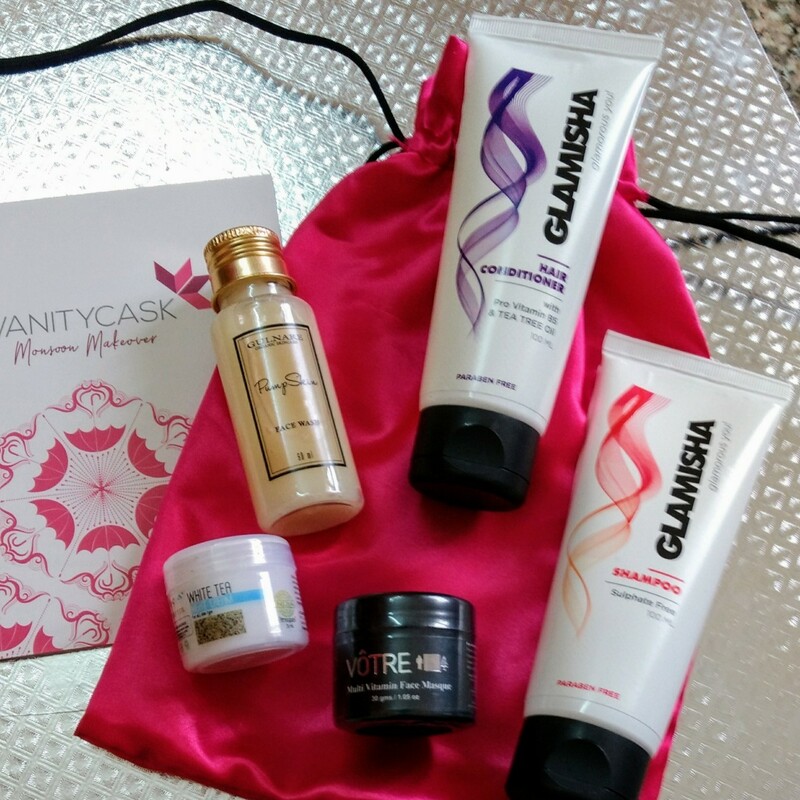 When I received the VanityCask August Box - Monsoon Makeover I was super excited. The theme revolves around the Monsoon keeping in mind the special needs of the season. Checkout the previous unboxing of the VanityCask boxes here. Let's see what all the box has to offer. This one is a new brand but since Sulphate free shampoos work well for me, I may give this a try. The product is a full size in the box. Brand Claims - The Sulphate Free Shampoo from Glamisha uses the most premium ingredients that moisturise & nourish your hair. The Shampoo is a non-foaming formulation, which is sulphate and paraben free. The aloe-vera in the shampoo has healing properties which conditions your hair, as you perform your cleaning ritual. Price - 395 INR for 100ml. Full size in the box. I like using a hair conditioner on days when I have to attend any function or am meeting my friends. I rarely use them as they tend to weigh down my hair too much, making my hair limp. Let's see how my experience is after using this product. Again this product is a full size in the box. Brand Claims - The Glamisha Hair Conditioner loaded with Pro Vitamin B5 & Tea Tree Oil is the perfect follow up to your shampooing routine. The Tea Tree Oil helps to unclog hair follicles, nourish your roots and reduce hair fall gradually. The Pro Vitamin B5 helps preserve moisture, and the Aloe-Vera conditions the hair. Gulnare has nice product range, however I haven't purchased any products considering the price range. I liked the Aloe Vera and Vitamin E Face Cream received in the June box as well as the scrub in July Box. If you are following my blog you might be knowing that I use dry powder cleansers and may skip this as I don't want to again change my face acre routine. This is the third full size product in the box. Price - 400 INR for 60 ml. Full size in box. After having a good experience with Votre Advanced Multi Vitamin night Cream, Votre Absolute Hydration Moisturiser and Votre scrub, am looking forward to trying this Masque which is a multi vitamin one. The product received is 30 gms deluxe sized, but as you all know a face pack goes a long way with as a thin layer also does the trick. Brand Claims - The perfect monsoon recovery face-mask, this product is enriched with rich properties of botanical extracts & essential oils, this extra-ordinary face masque rejuvenates the skin & improves skin elasticity. It also removes pigmentation marks & blemishes & reduces skin ageing. The multi vitamin masque will make your skin healthy and glowing. This masque is proven to lighten the appearance of dark spots, correct uneven skin tone, and significantly brighten the complexion. The highly concentrated treatment formula is also proven to replenish and preserve hydration for 24 hours, promote suppleness and smooth skin texture so you get youthful-looking, luminous skin. Price - 1260 INR for 100 gms. Sample size of 30 gms in the box. I have literally fallen in love with TNC massage cream and Bearberry Liquorice cream which I have used previously. I am sure this night cream will also be a good bet considering the ingredients. I will be posting a review of this cream so stay tuned for it. Brand Claims - Here’s how you put your skin in recovery mode as you go to sleep, this monsoon! White tea has anti- ageing effects and antioxidant properties that boost the immune function of the skin cells. In addition, it replenishes and hydrates your skin. This product from The Nature’s Co. takes care of all your skin woes while you rest in slumber. Price - 995 INR for 50 gms. Sample size of 25 gms in the box. They also have an offer if you buy a 3 month subscription for 2399 INR and get a Babor product worth 4800 INR absolutely free. There is an option to select product of your choice from Babor range. Overall the box has come a long way from providing sample size products in the initial Editions to full size products along with popular brand sample size products in the latest edition. I really like how the products are selected keeping the season and theme in mind. I am really happy with this month box. I have always longed for brands like Votre, Gulnare Skincare and TNC but never purchased any full size products due to their high price range. This box gives me the opportunity to explore these brands keeping my budget in mind. 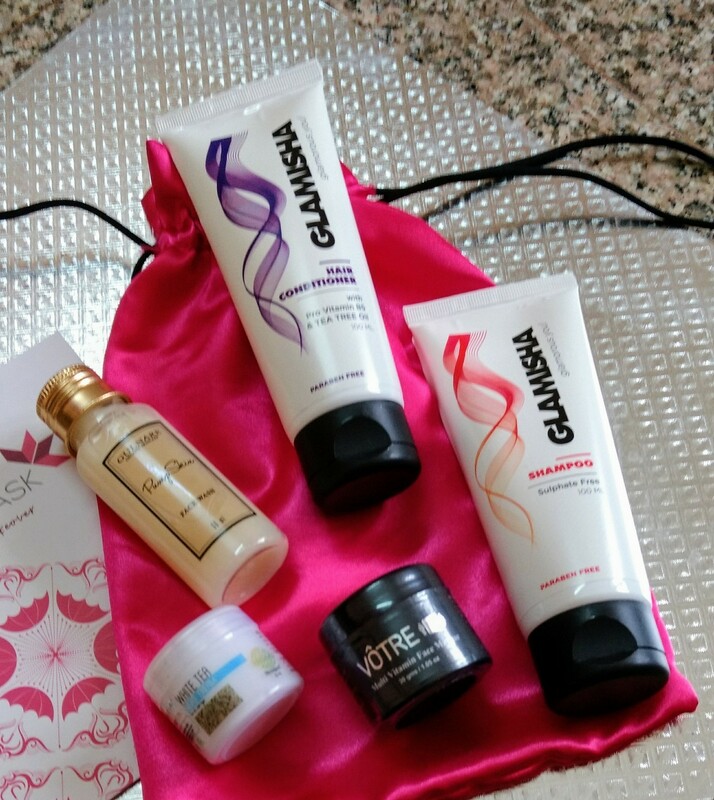 Totally recommended this month's Monsoon Makeover box.